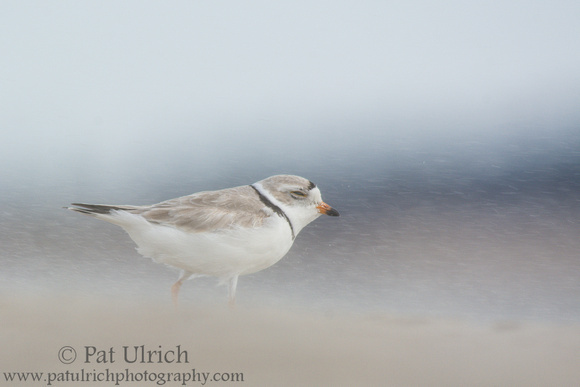 As I mentioned in my favorite photos of 2017 post, this very friendly piping plover gave me a lot of great looks as it sprinted across the sand and then stopped on a dime. It's an interesting behavior -- I'm not sure if it's related to finding prey or to evading predators, but its certainly common among the piping plovers I've had a chance to observe. After I positioned myself in the sand, the plover kept working its way closer, giving me wary but seemingly curious looks along the way. It continued to close the distance between us, with the frame below being taken at 270mm on my telephoto zoom. Eventually, it came close enough that I could no longer attempt to focus on it (my Tamron has a minimum focusing distance of 8 feet), so I pulled back from the viewfinder and just enjoyed the chance to observe a gorgeous shorebird at close range. It's always special to earn the trust of a wild animal and the opportunity to share space with it on its own terms! 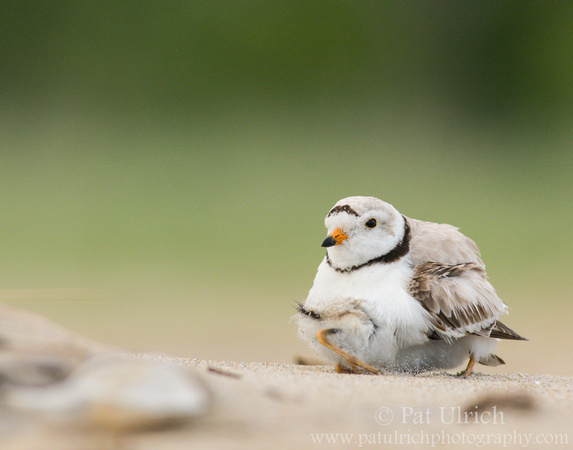 I led off my favorite photos of 2017 post with this handsome piping plover and its chick set against the lush green backdrop of the dunes. On its own, that image (the last in this post) warms my heart with a tender moment between a parent and the most important being in the world to it (something I can now relate to!). I think the full context of this image is interesting to show as well. It was a reasonably nice day on the beach, but there was an occasional stiff wind ripping over the inlet and across the spit of sand at the tip of Sandy Point State Reservation. The strong gusts were pelting us with blowing sand, and this noble adult was attempting to shelter its chick from the elements. But when the winds settled down, the chick was ready to go again, and quickly pulled away from the warm embrace of its parent. It paused for a moment, leaning in for reassuring touch before darting across the sand on its own. I can empathize with how I imagine the parent must have felt, left behind to watch its offspring cutting out on its own -- still needing protection and assurance, but also the chance to explore the world independently. No matter how much we want to, there's only so much we can do to protect our kids, and at least mine still has a while to go before he's charting his own path across the beach! 2017 was an exciting year for me, though not as much for photography. We welcomed our first child to the family, and it has been so much fun being a new father. 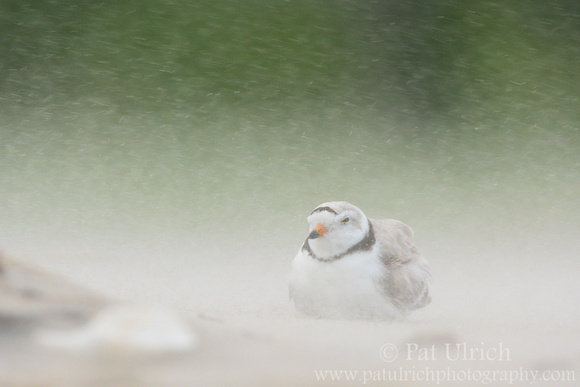 This, of course, has left my free time pretty limited -- though I did make a few pre-baby trips to Plum Island to look for piping plovers, and I had a chance to spend time with a small flock of sandpipers on our first trip with the baby to Southern Maine. I enjoy reflecting on the images I've taken each year, and even with only a handful of photographic opportunities this year, I was still able to come home with a few noteworthy photos. I'm far too late to submit to Jim Goldstein's Annual Blog Project -- but it remains an inspiration for this yearly endeavor. Here are my five favorite photographs from 2017. This is perhaps my favorite of the year based on the context of my own 2017. 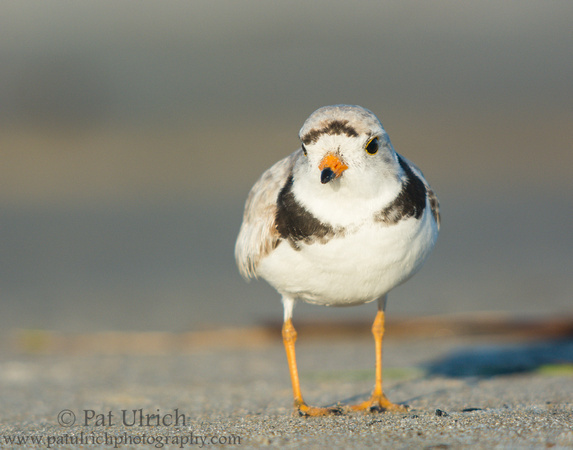 While waiting for the arrival of my son this summer, I was able to get away for a short outing to look for baby piping plovers at Sandy Point State Reservation on Plum Island. 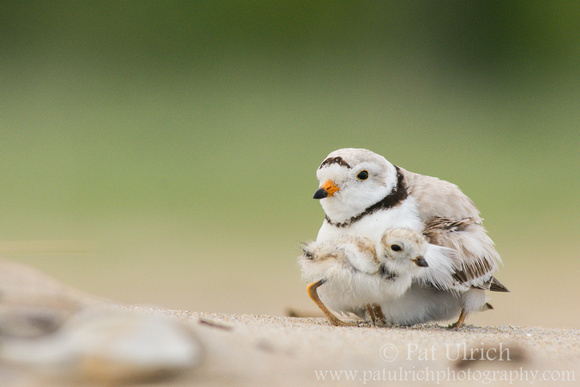 Two years ago, I had a handful of very productive trips there and there seemed to be plover chicks all over the beach with some parents watching over as many as four at a time. Unfortunately, this was one of only three chicks I saw on the beach this year, and it was the single chick in the clutch for this parent. While it was disappointing to see so few nesting plovers, it was special to observe this parent watching over it's chick -- especially when I knew that my own son would be arriving soon. While humans have our own set of challenges as new parents, at least our babies aren't born mobile and running around on the beach evading predators from day one! 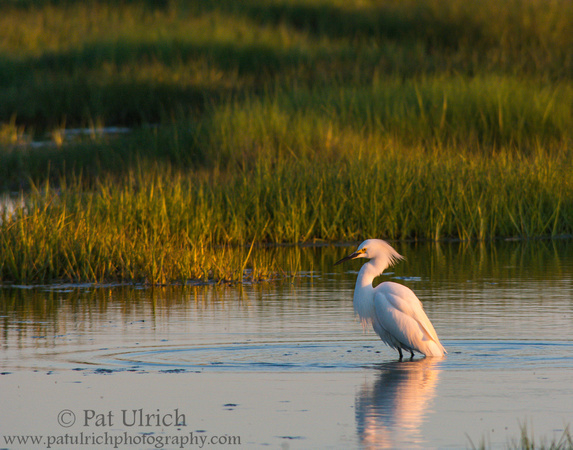 On my drive out of the refuge as the last of the sun's rays were slipping past the horizon, I saw this lone egret working the salt pannes of the Great Marsh. Wetlands are by far my favorite ecosystem, and yet I've struggled to create many meaningful images of them. This one came together nicely for me -- with the low golden light, a beautiful white bird causing waves of ripples, and the lush greens of springtime salt grass. Taking in a scene like this with a deep cleansing breath is food for my soul. The wind was really whipping on this trip. My face was scoured by sand while walking along the beach, but when going down to ground-level, I could get an even stronger feel for how tough it must be to live in this harsh coastal environment. I was able to create a series of interesting images with the sand blurring out the scene, and the plovers finding any small shelter they could on the beach. 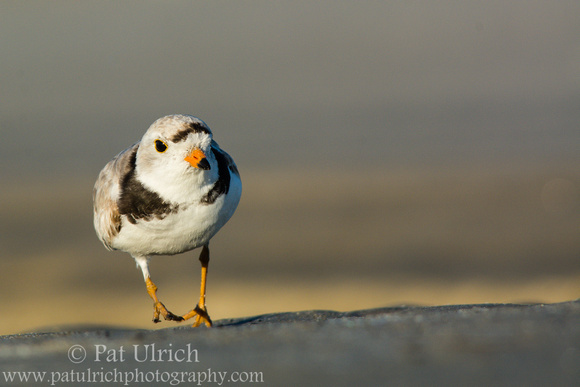 But in this one, the steadfast strength of the small bird pushing forward into the driving sand speaks to me. We took a weekend trip to Southern Maine in the fall to introduce my son to the coast. He had a blast on our afternoon visit to the beach, and I sincerely hope we're able to pass to him our love of the coastal environment. The next day, my wife graciously made me get up before the sunrise to seek out some shorebirds. I took a long walk along Ogunquit Beach with the rising sun and found none. Then, as seems to happen far too often, as I was nearly back to my car the birds were hanging out in sight of the parking lot! The contours of the beach and rising tide limited my ability to get a good position with the sun over my shoulder without getting soaked. But the birds were extremely friendly, so I tried to make the most of the situation. I attempted some more stark backlit silhouettes with reflections in the wet sand, but this composition worked best in a fleeting moment when a cloud passed over the sun. Thanks for taking a look through my favorites from the past year, and all the best to you for 2018!